The conference aimed at sharing the significant evolution in technology and expertise in endoscopic surgery. 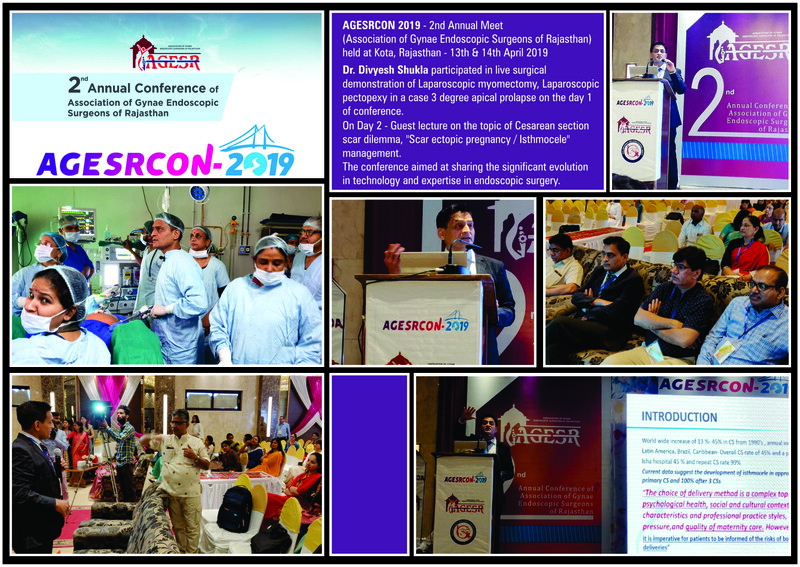 AGESRCON 2019 – 2nd Annual Meet (Association of Gynae Endoscopic Surgeons of Rajasthan) held at Kota, Rajasthan – 13th & 14th April 2019. 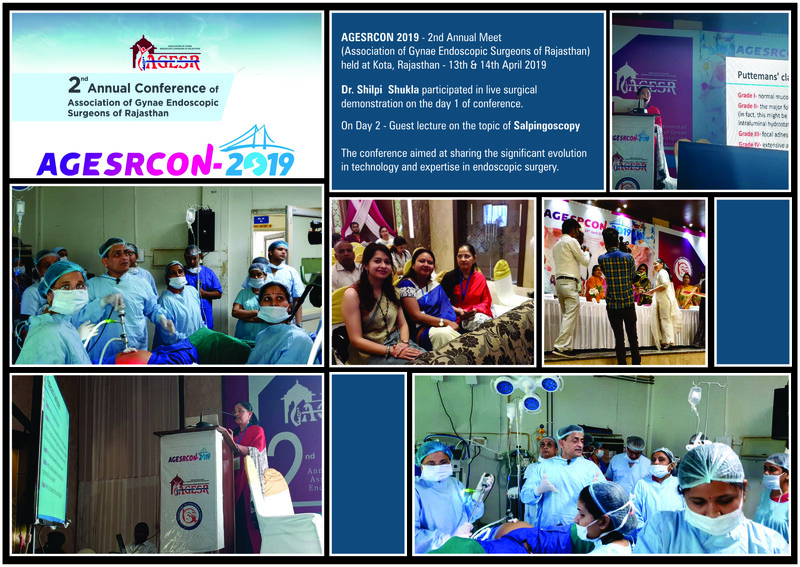 Dr. Divyesh Shukla participated in live surgical demonstration of Laparoscopic myomectomy, Laparoscopic pectopexy in a case 3 degree apical prolapse on the day 1 of conference. 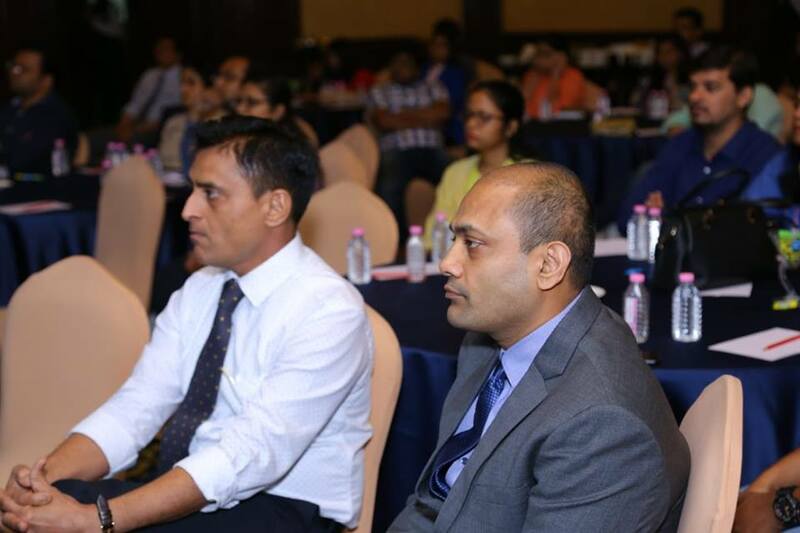 On Day 2 – Guest lecture on the topic of Cesarean section scar dilemma, “Scar ectopic pregnancy / Isthmocele” management. 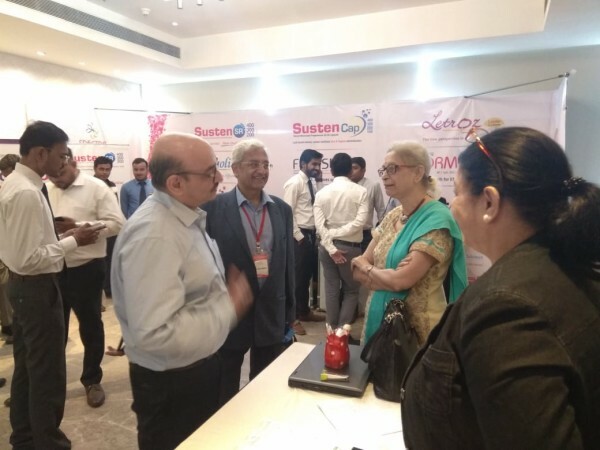 Dr. Divyesh Shukla attended FOGSI Conclave, held at Mumbai on 19th February 2019. 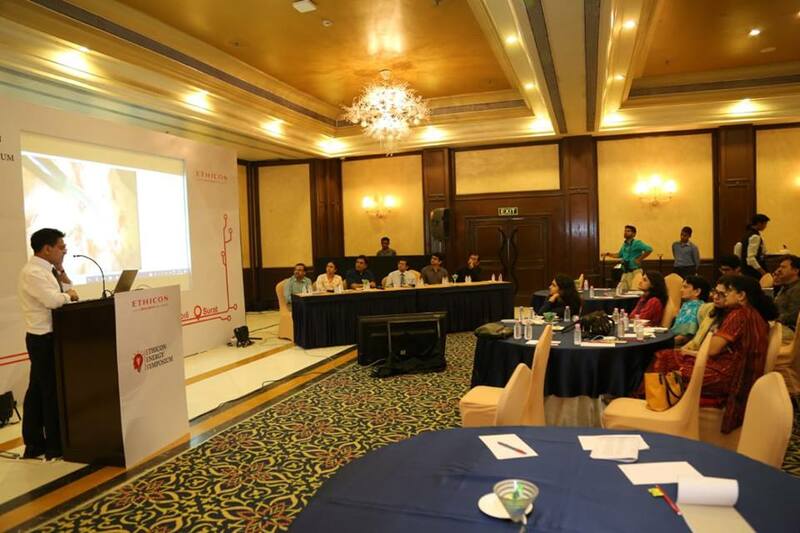 ‘Endometriosis Protocols for Practice’ – conclave was graced by the who’s who of FOGSI and key opinion leaders including practicing gynaecologists, ART consultants and endoscopic surgeons. 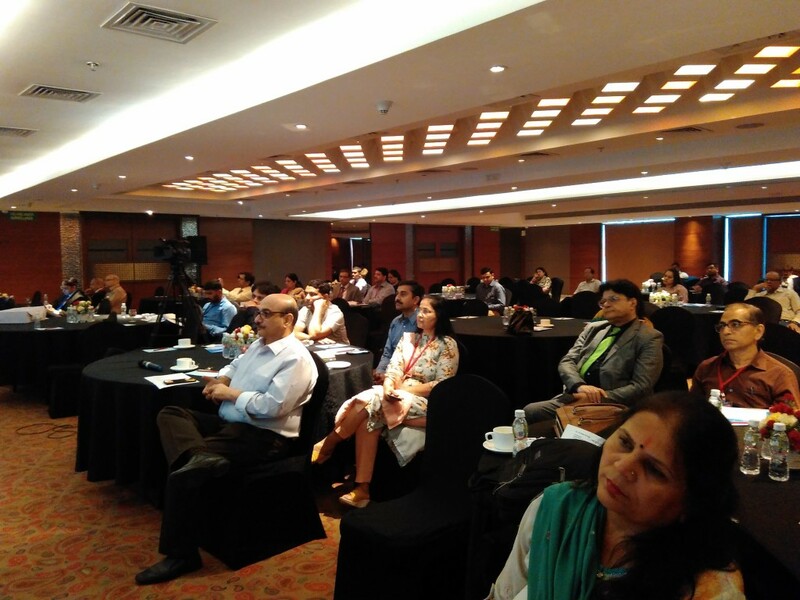 “ Developmental Pediatrician’s perspective of early childhood development” The session was well received by all. 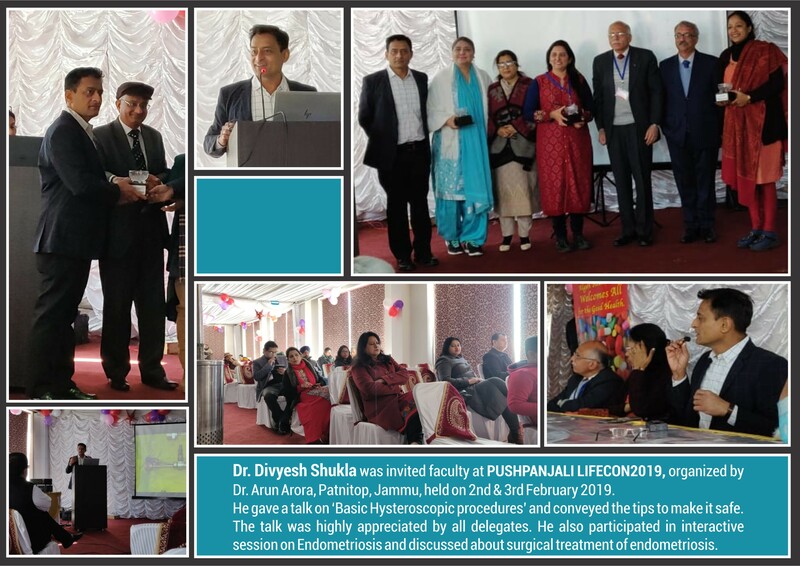 Dr.Divyesh Shukla was invited faculty at PUSHPANJALI LIFECON 2019, organized by Dr. Arun Arora, Patnitop, Jammu, held on 2nd & 3rd February 2019. 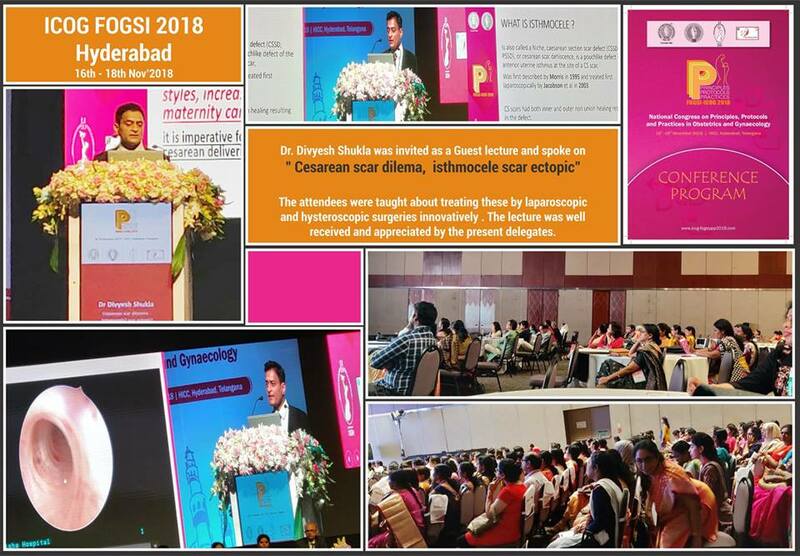 He gave a talk on ‘Basic Hysteroscopic procedures’ and conveyed the tips to make it safe. The talk was highly appreciated by all delegates. 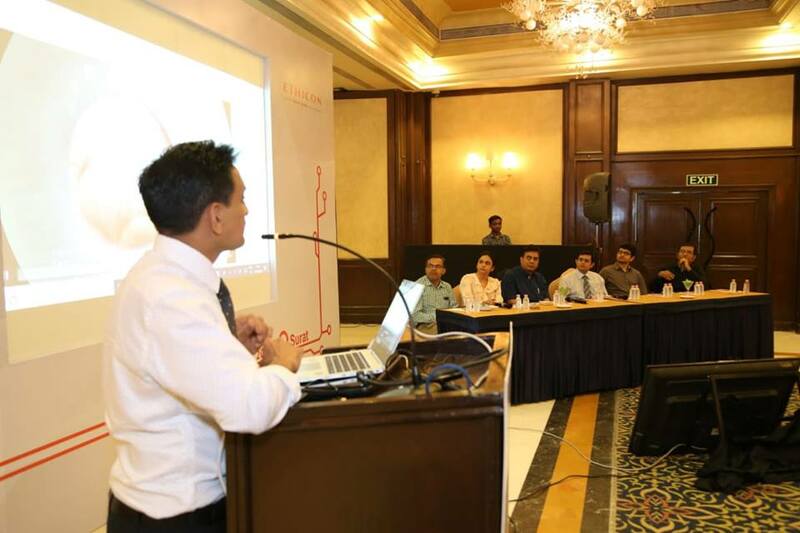 He also participated in interactive session on Endometriosis and discussed about surgical treatment of endometriosis. 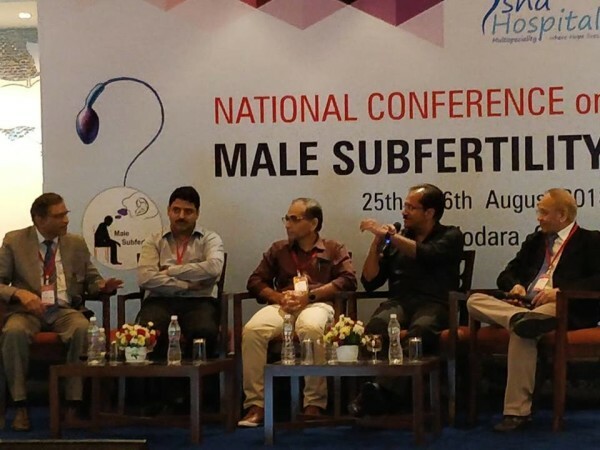 Dr. Divyesh Shukla was invited as Guest speaker , to speak on the topic of “TLH for the Large Uterus”, emphasizing on the technical aspects. 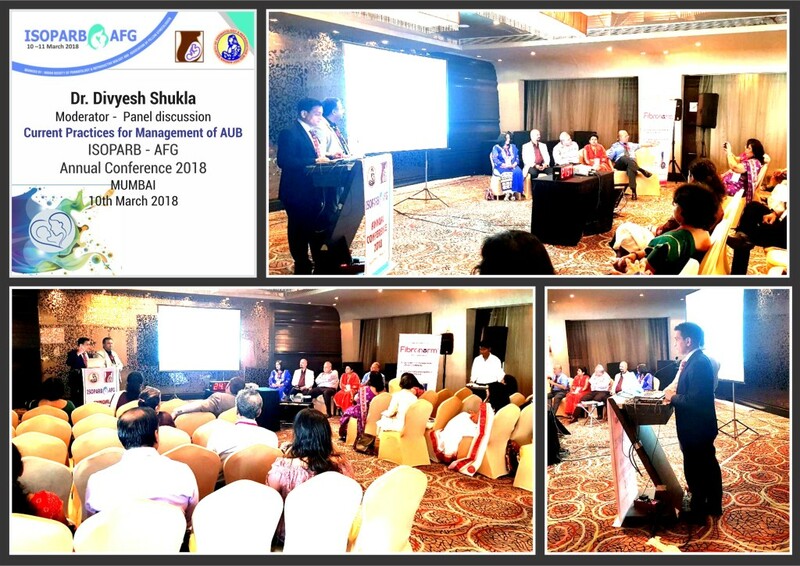 Urogynaec 2018 – Organized by South Asian Federation of Urogynaecology(SAFU), Society of Vaginal Surgeons of India (SVSI) & Ahmedabad Medical Association (AMA). held at Ahmedabad 13 – 16 December 2018 ,a Surgical feast & Gynaecological bonanza . 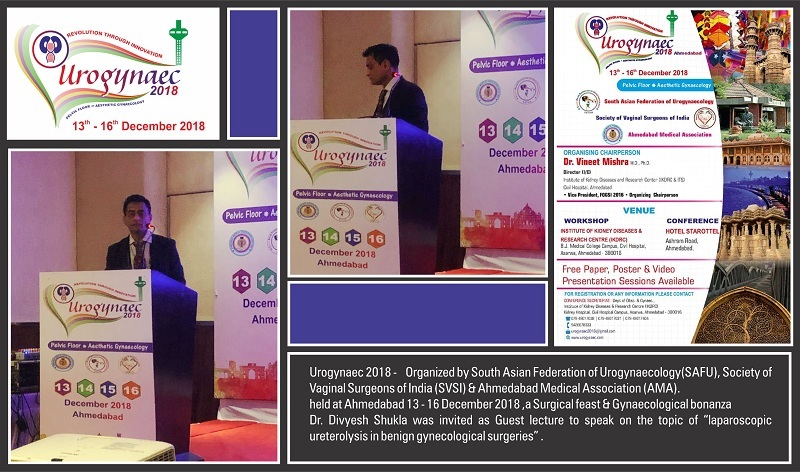 Dr. Divyesh Shukla was invited as Guest lecture to speak on the topic of “laparoscopic ureterolysis in benign gynecological surgeries” . 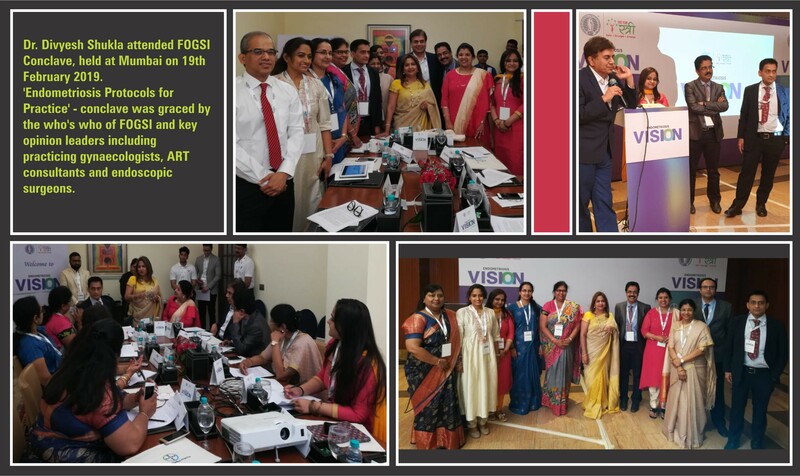 ICOG FOGSI 2018 – Hyderabad 16th – 18th November 2018. 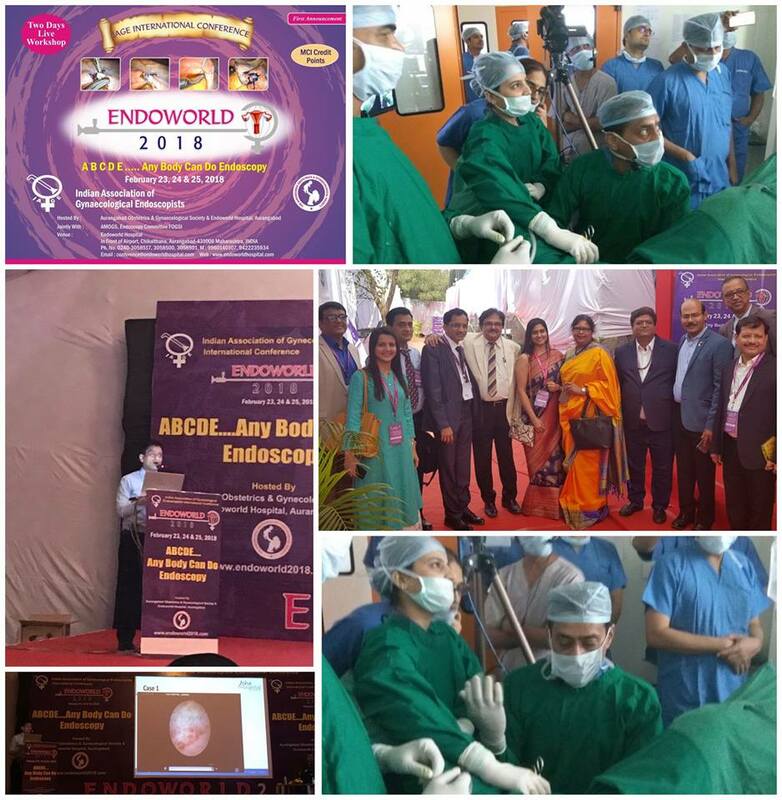 The attendees were taught about treating these by Laparoscopic and Hysteroscopic Surgeries innovatively . The lecture was well received and appreciated by the present delegates. ” Friedmen’s curve to manage labour in 21st century” enlightening delegates in changing patterns of labour in current century. The lecture was appreciated by the present delegates. 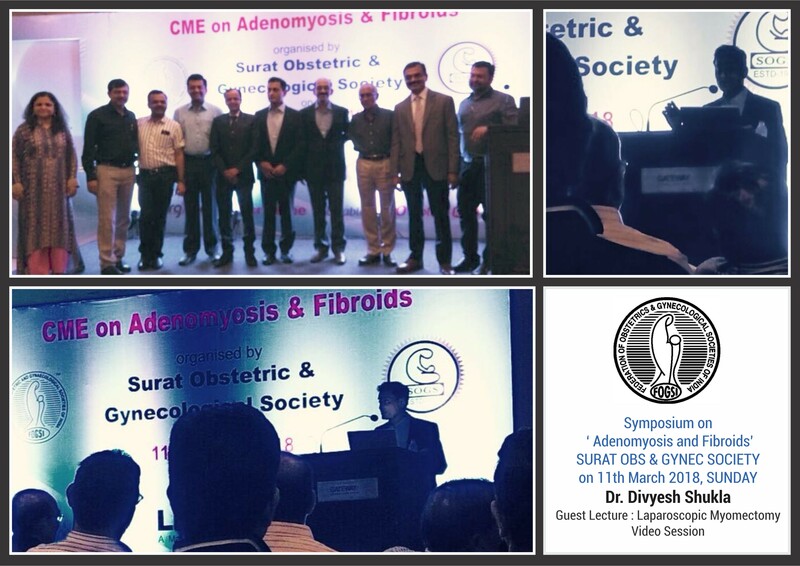 Dr. Divyesh Shukla delivered prestigious AOGS Oration on the topic of ‘ Minimal Access Surgeries for genital tract malformations’. Dr. Shilpi Shukla was invited as a guest lecture to speak on ‘Premenstrual Syndrome’. 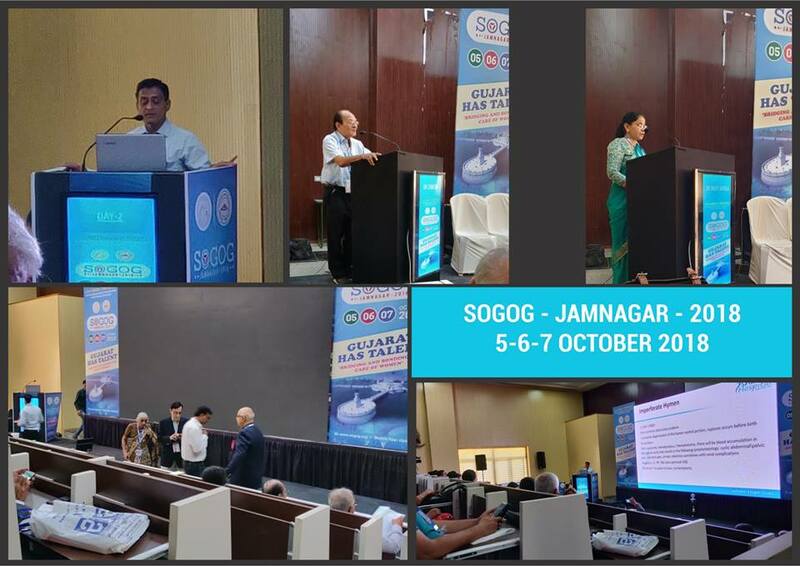 EES – Ethicon Energy Symposium, a knowledge and experience sharing scientific session, organized by ISAR – IAGE in association with SOGS, held at Surat (15th & 16th September 2018). 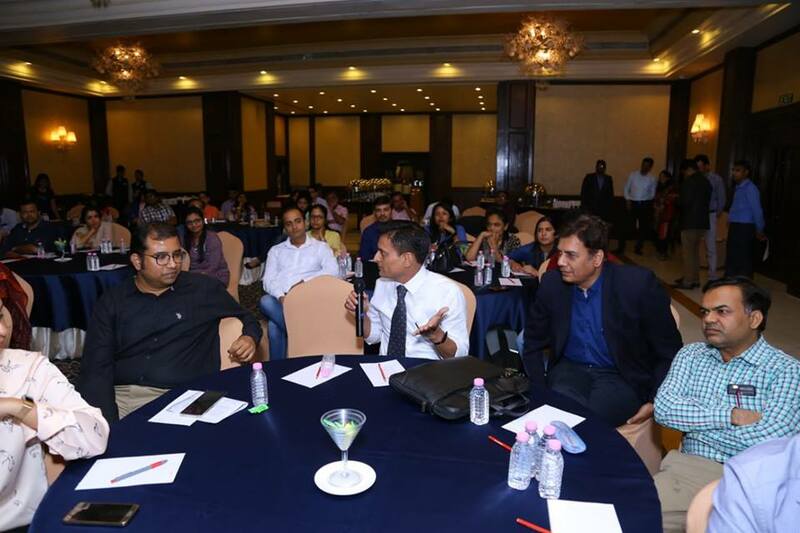 Dr. Divyesh Shukla had been invited as a Guest lecture , as a moderator,and also participated in a panel discussion. 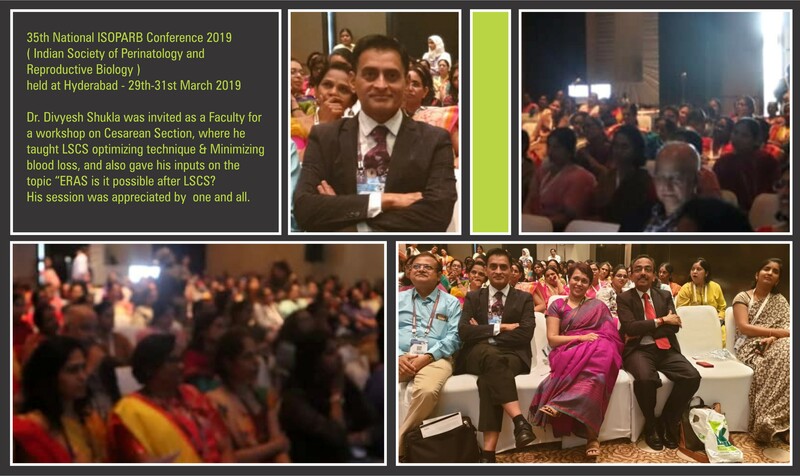 Congratulations, Dr. Ajay Valia, for the huge success of the conference. 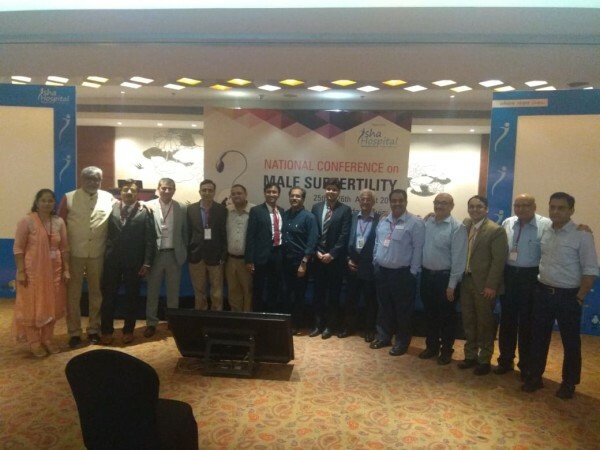 The two day academic feast , a National Conference on Male Subfertility, very well conceived and executed, was applauded by one and all. Its a rare occasion when stalwarts of the respective fields come together on such a platform to share their knowledge and experience. We wish to thank the respected Speakers, faculties and the delegates, who collectively made this event a great experience. An initiative moving towards BFHI (Baby Friendly Hospital Initiative), Isha Hospital in association with WBW Alliance Vadodara 2018 , celebrates World Breastfeeding week (1-7 August 2018). 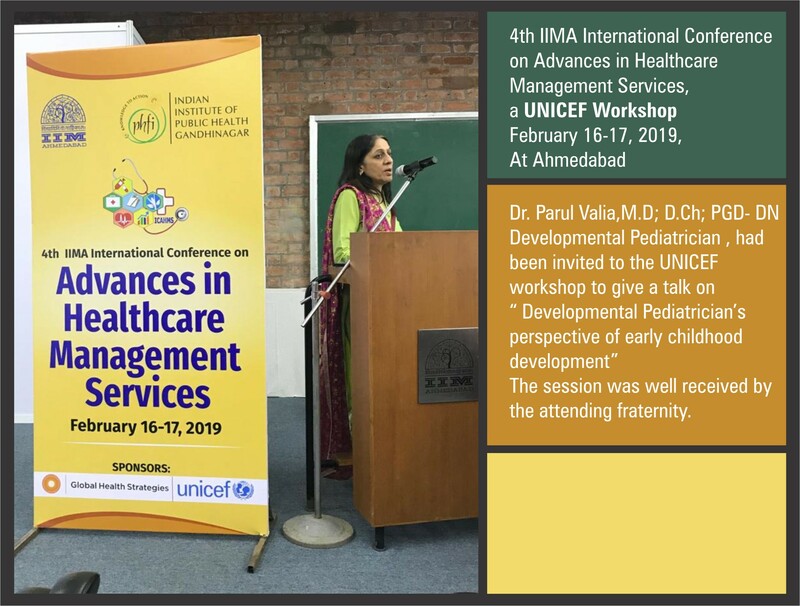 We join hands with #VadodaraMunicipalSevasadan, #Depatment of Food & Nutrition (MSUFNAA) #Department of Pediatrics , Gynaec & PSM of SSGH & GMERS Gotri, #BOGS, #AcademyofpediatricsVadodara, #UNICEF, #WHO to spread awareness of BREASTFEEDING. 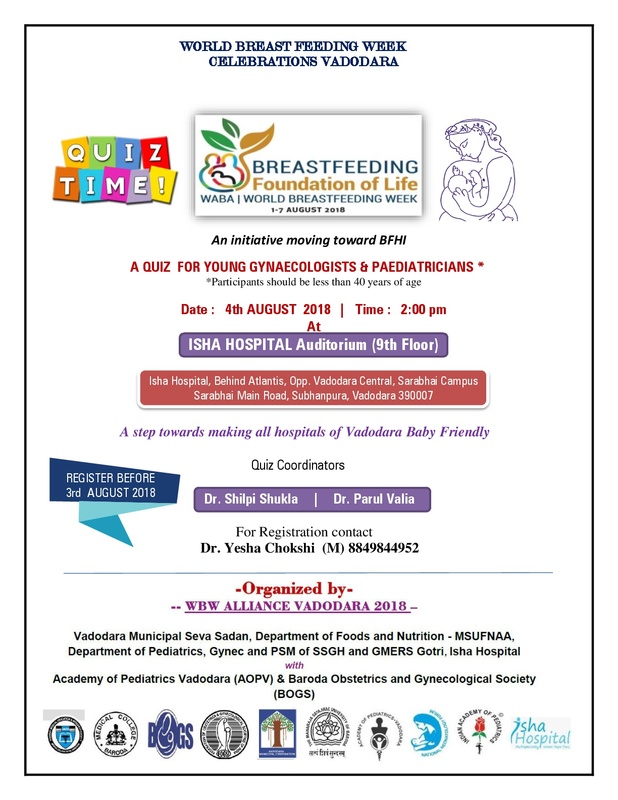 We are organizing a Quiz for the Young Gynecologists & Pediatricians, on 4th August 2018 at Isha Hospital, 9th Floor-Auditorium, at 2:00 pm. Kindly be a part of the initiative and Register before 3rd August 2018. 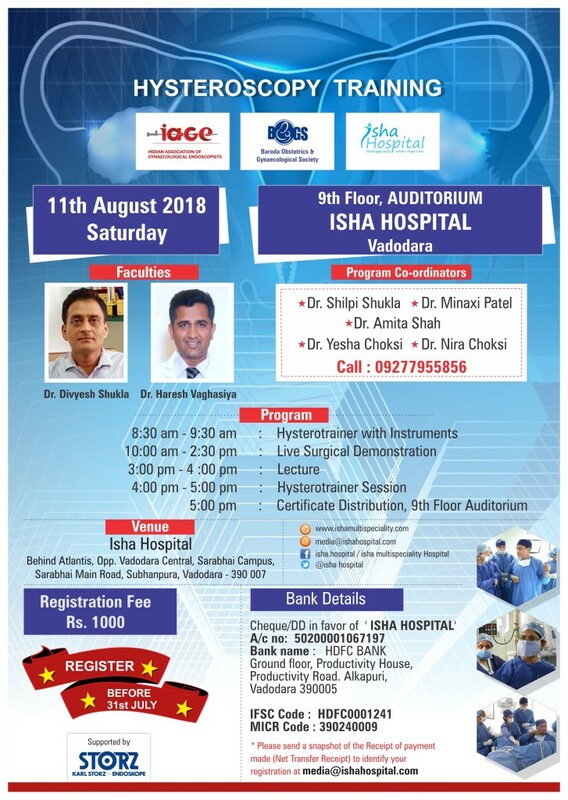 Date : 11th August 2018, Venue : 9th Floor, Auditorium, Isha Hospital. 7th ILES 2018- Workshop - 15th to 17th June 2018 at Kochi, Kerala, India. 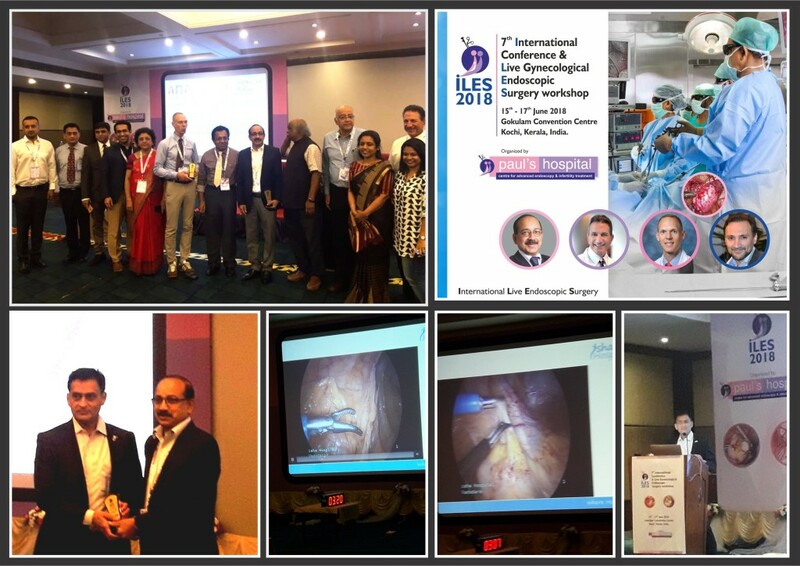 Dr. Divyesh Shukla Moderated the Surgical session, and also gave a guest lecture on Laparoscopic adhesinolysis and adhesion prevention at ILES2018 , Paul’s Hospital, Kochi, Kerala. 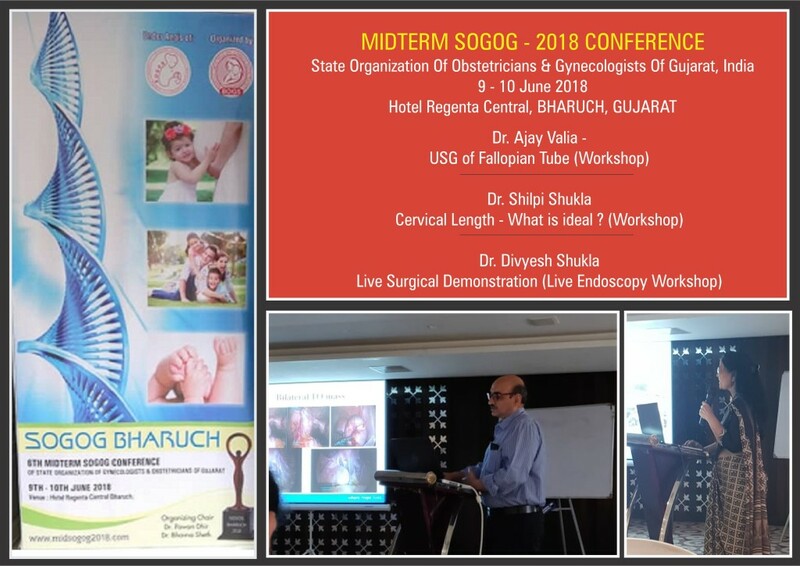 MID SOGOG – 2018 Conference – State Organization of Obstetricians & Gynecologists of Gujarat, India – held on 9th & 10th June 2018 at Bharuch (Hotel Regenta Central). 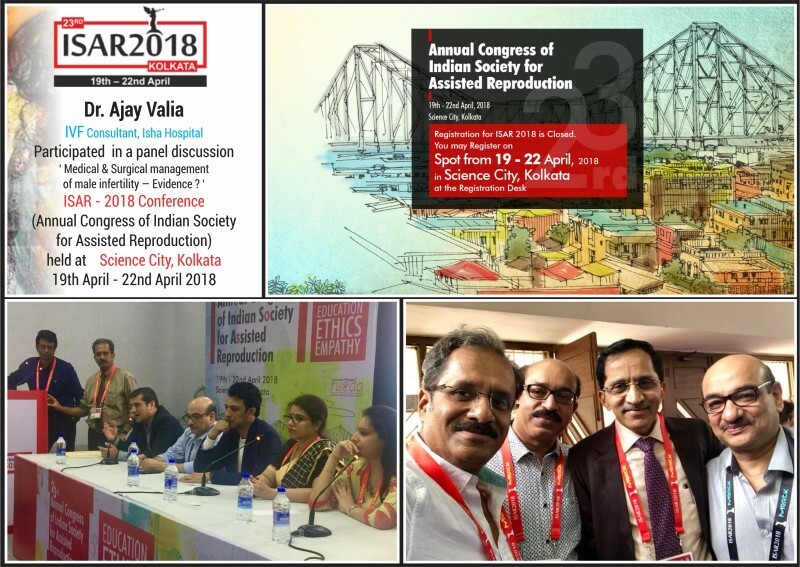 Dr. Ajay Valia, Dr. Divyesh Shukla and Dr. Shilpi Shukla were invited for their participation in the conference, which was well received and appreciated by the attendees. 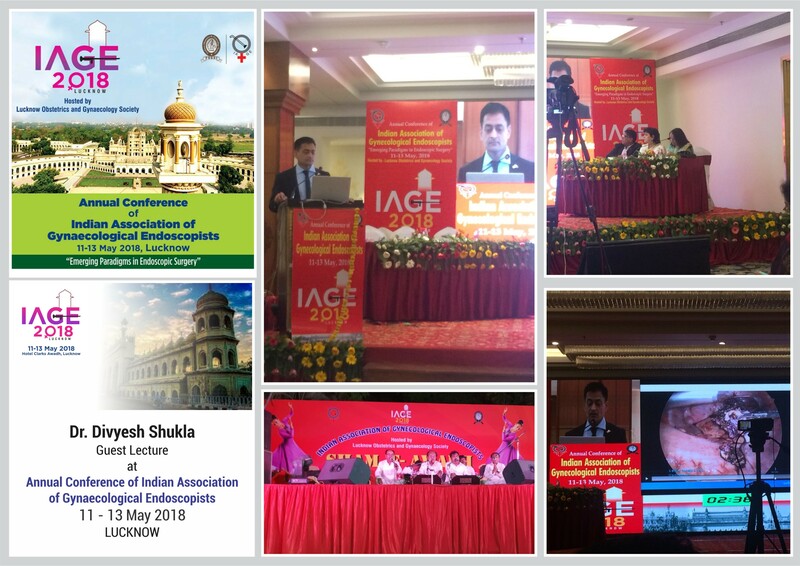 IAGE – 2018 , Annual Conference of Indian Association of Gynaecological Endoscopists – held on 11 – 13 May 2018, at Lucknow. Dr. Divyesh Shukla was invited as a Guest lecturer. 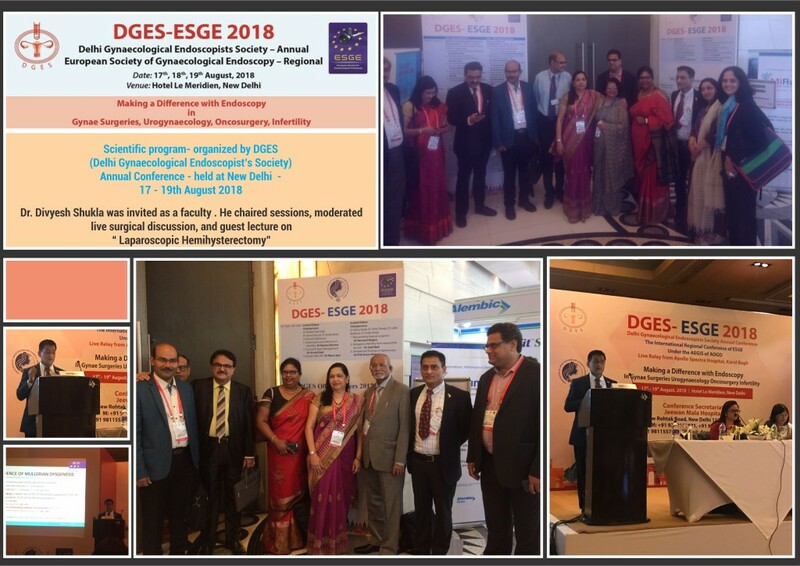 RAGE – 2018 , International Congress and workshop on ” Recent advances in Gynaecological Endoscopy and Urogynaecology” held at Bengaluru on 27th -28th- 29th April 2018. 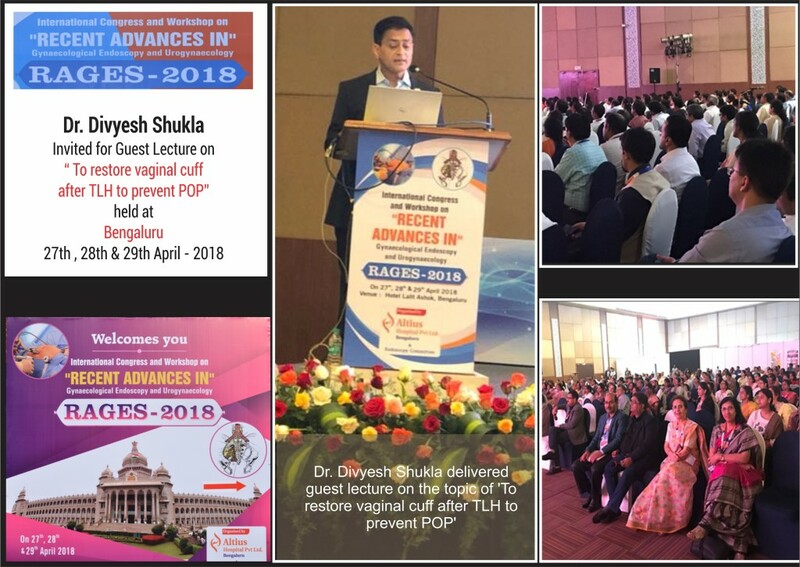 Dr. Divyesh Shukla was invited as a faculty to speak on ‘To restore vaginal cuff after TLH to prevent POP’ well appreciated by the attendees. 19th April – 22nd April 2018. 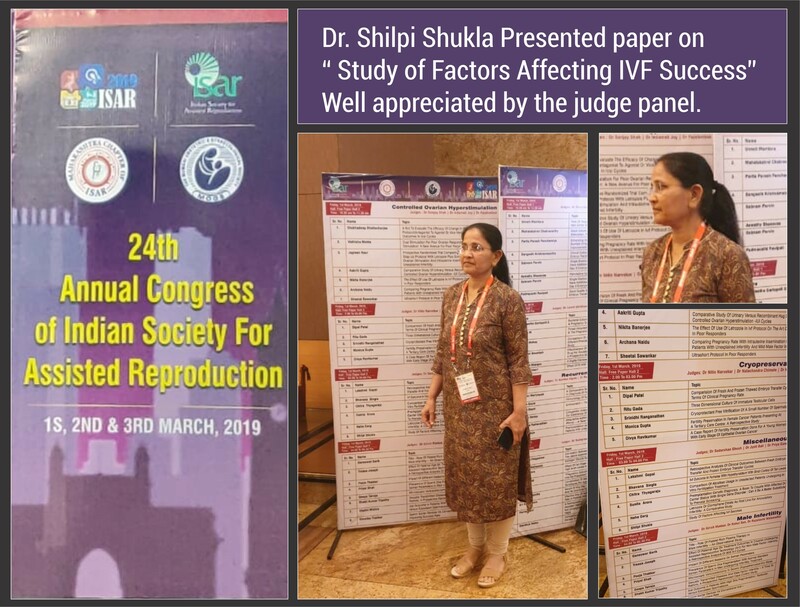 Dr. Shilpi Shukla was invited as a faculty for Video presentation on ‘Salpingoscopy’ , and presented paper on ” Comparison of GnRH agonist vs/antagonist protocol in IVF treatment for PCOS patients. IUI – Hands on Workshop at VAPI, Organized by Vapi Obstetrics & Gynaecological Society, on 1st April 2018, where leading IVF consultants from Gujarat and Mumbai participated. 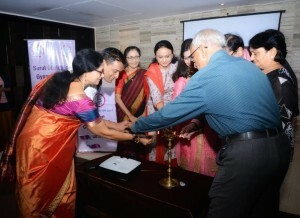 Dr. Shilpi Shukla & Dr. Divyesh Shukla were invited guests. 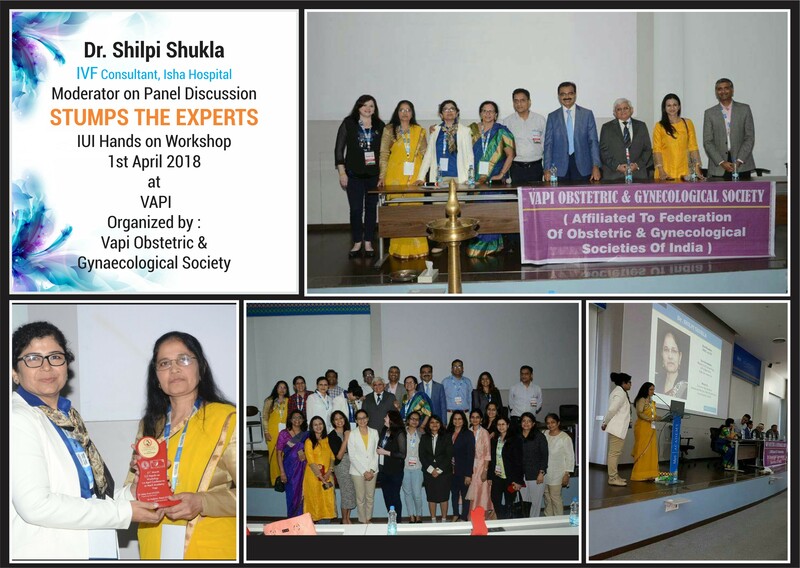 Dr. Shilpi Shukla MODERATED panel discussion, on the topic ‘Stumps the experts’. Panel discussion was informative and interactive. 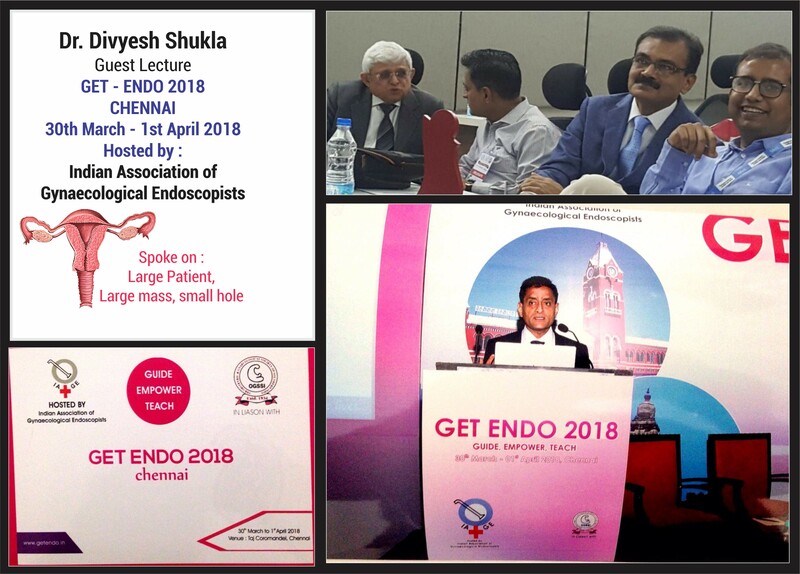 GET- ENDO 2018 , at CHENNAI, hosted by Indian Association of Gynaecological Endoscopists, on 31st March. Dr.Divyesh Shukla delivered guest lecture on Large patient, large mass, small hole. 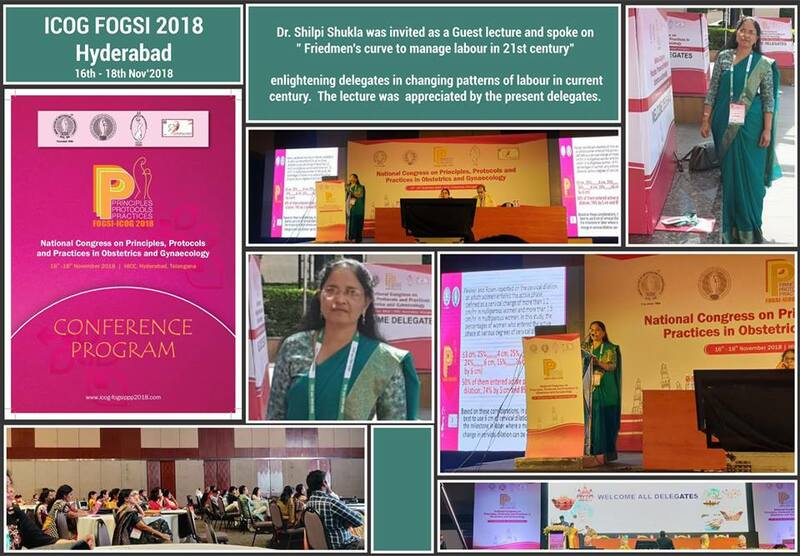 61st All India Congress of Obstetrics & Gynaecology - Odisha - Bhubneshwar - 17th - 21st Jan 2018. 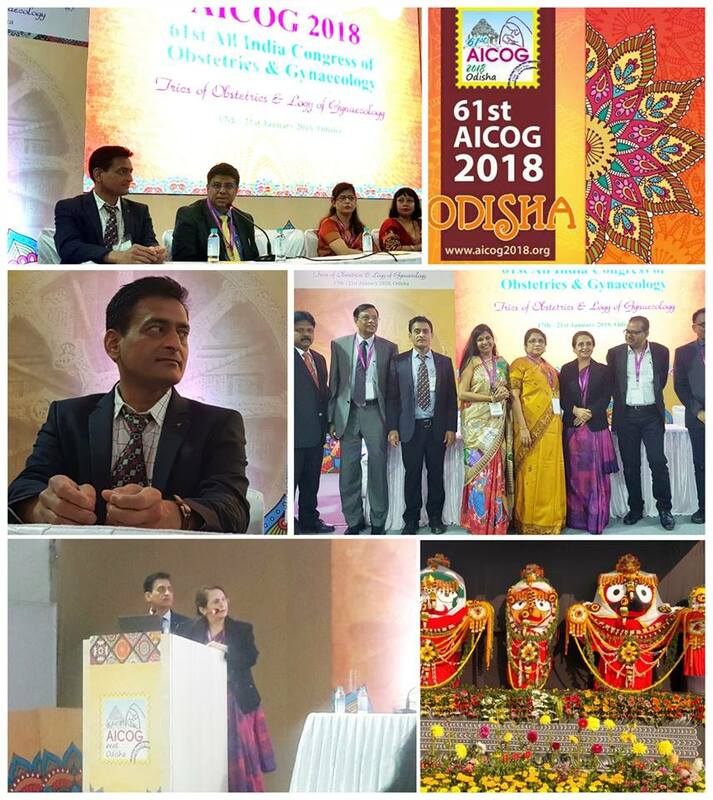 61st All India Congress of Obstetrics & Gynaecology – hosted by The Association of Obs & Gyn of Odisha – Bhubneshwar – 17th – 21st Jan 2018. Dr. Divyesh Shukla was Invited as faculty 1. Panelist in FOGSI ENDOSCOPIC committee workshop, 2. 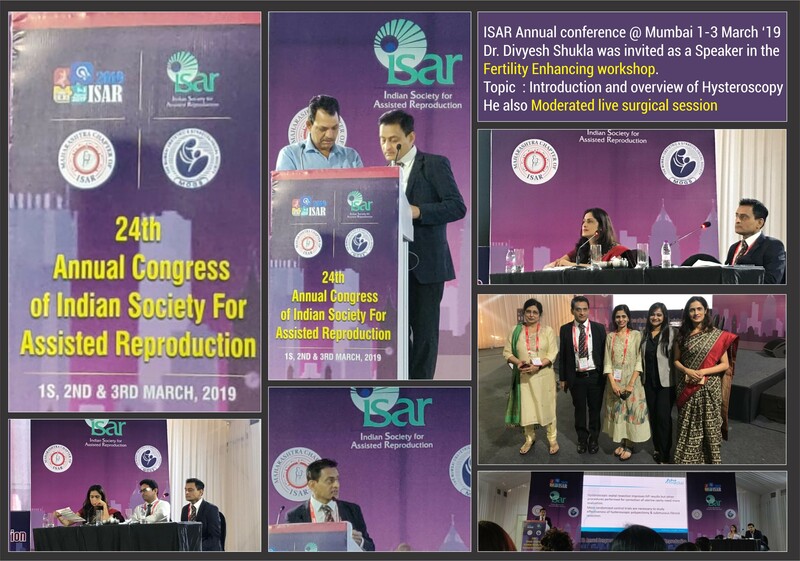 Moderated panel on Complications in Hysteroscopic surgeries, 3. 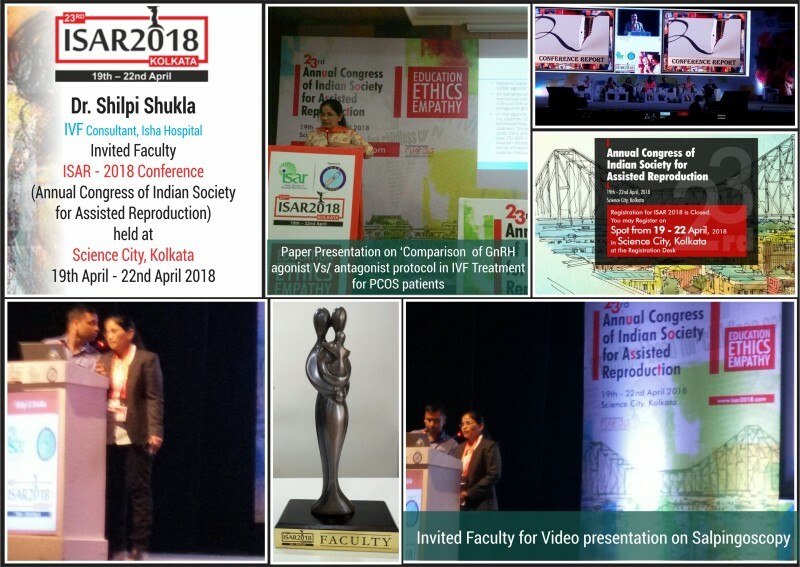 Key note address on Prevention and management, complications of hysteroscopy. Isha Hospital organised an Educational Scientific session, on 28th November 2017, at Dahod. 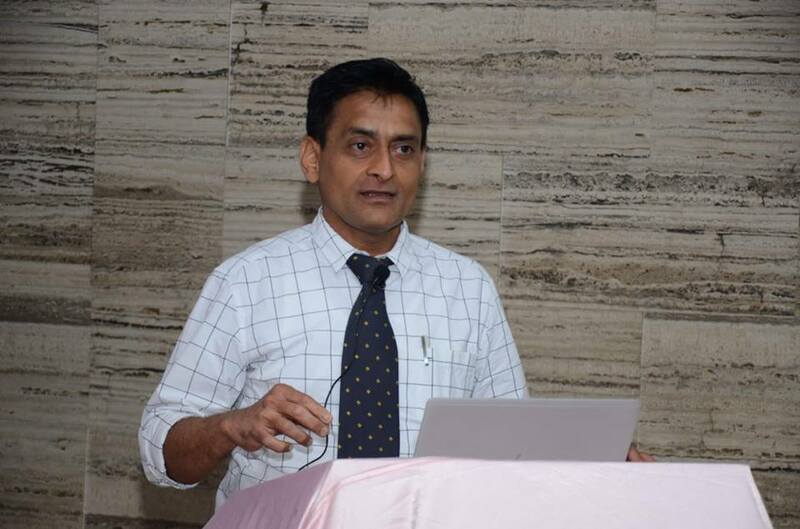 Dr. Mohammad Gandhi (MD paediatrics, Fellow Neonatologist ) spoke on ‘Therapeutic Hypothermia-only evidence based neuroprotective treatment for Ischemic encephalopathy’, well received by the attending doctors of Dahod. Isha Hospital brings to Gujarat for the first time “Therapeutic Hypothermia COOLING MACHINE (Criticool) & aEEG (CFM Brainz Monitor), to its NNF Accredited NICU. 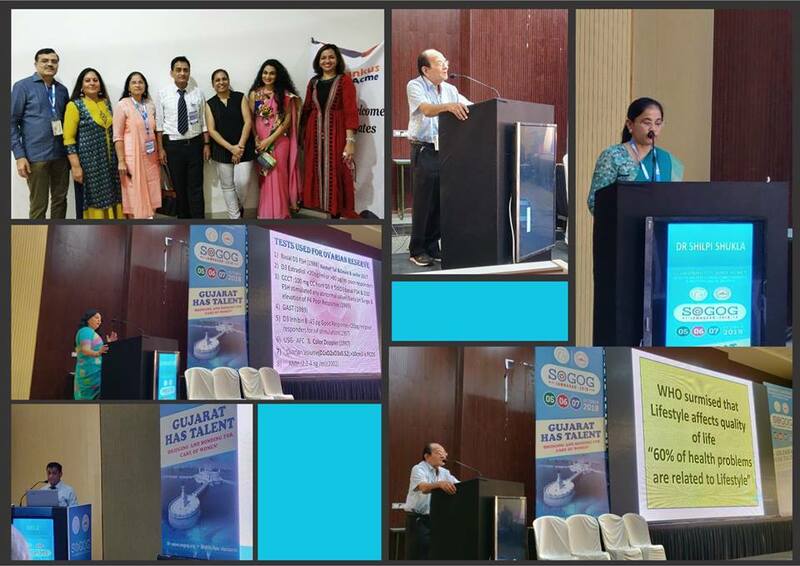 Isha Hospital​ had the privilege to host a very successful Conference & Workshop on ” Therapeutic Hypothermia & aEEG application in birth asphyxia” , where renowned academicians & practitioners were invited to enlighten the participants , basically Neonatologists, Paediatricians, Obstetricians, and postgraduate students. 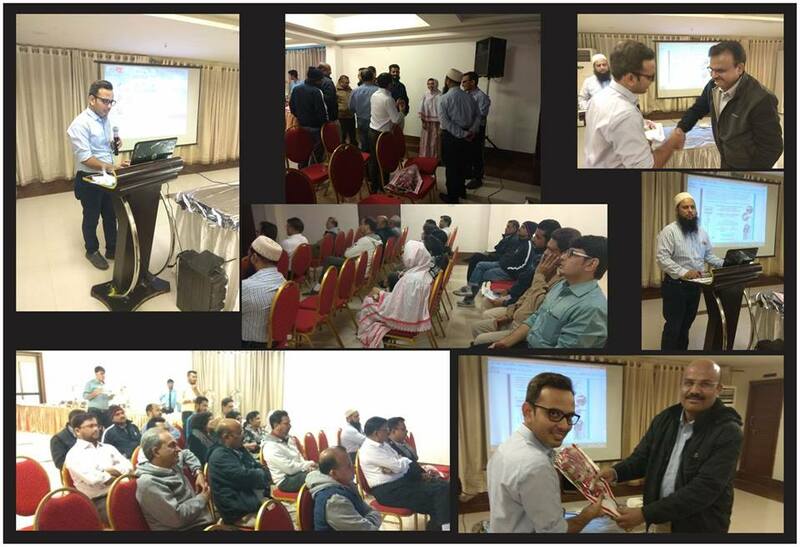 Glimpses of 37th SOGOG Conference held in December 2013, hosted by BOGS. 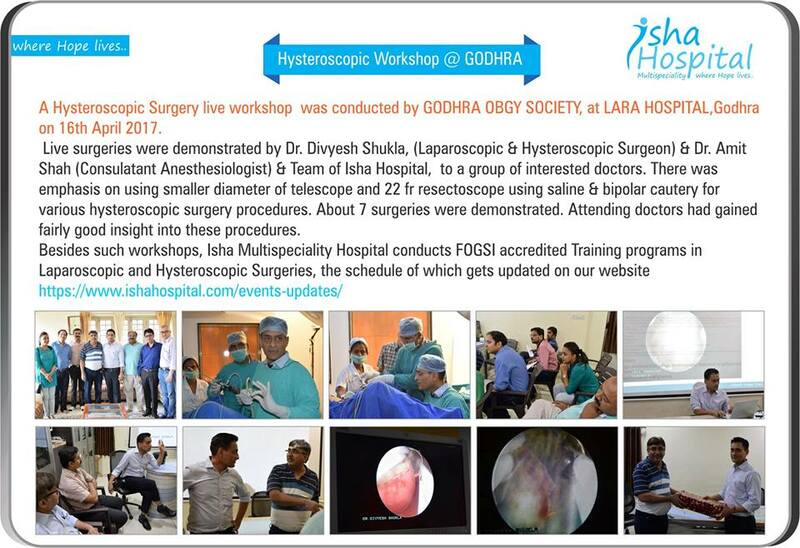 Isha Hospital hosted “Live gynaecological endoscopy surgery workshop” on 6th December 2013.